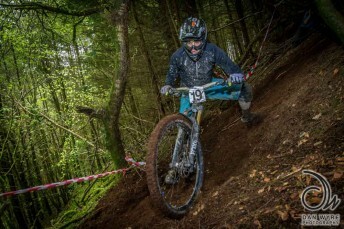 Phil Allum from the MB Swindon Race Team was up at Baskerville Hall in Clyro for the final round of the Mondraker Enduro Series 2015. So stop what you are doing for 5 minutes, go make a brew and read what he has to say. 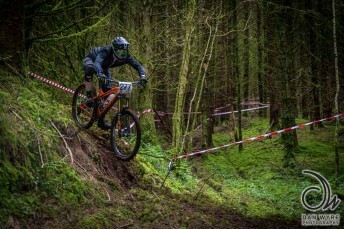 We headed off to the 5th and final round of the Mondraker Enduro Series, this final round being held at Baskerville Hall, Clyro, near Hay-on-wye. This was the location of the Dragon Downhill series from the late 90s and early 2000s, so should be just the ticket. There had been a steady stream of photos from the organisers leading up to race weekend, the most interesting ones showing us a proper rock garden and others of a set of stone steps that were to be used at the finish of one of the stages. The photos did not do them justice. The rock garden was full of football sized slabs, covered with trickling water that made it nice and slippery. Add in some tasty drops along the way and we had a proper scary gully run. From the start it became apparent that all the stages were on the same hillside, some barely 2 or 3 metres apart. This made it great for the spectators, who came out in force for heckling duties on the Sunday. It also meant that you could ride one stage and push up alongside the next to see what to expect. Saturday’s format followed previous rounds: a few hours’ practice on stages 1 to 4 then timed runs in the afternoon on those 4 stages. We rode round in a small group of 5 (James Scott, Sandy Stewart, Matt Snelling, Chris Keeble-Smith and myself) all having spills here and there, thankfully none serious. But having a good laugh trying to get down the runs in a clean fashion – which, given the drizzle that had engulfed us for most of the day – was pretty difficult. On Sunday we had nine timed runs to complete: stages 1 to 5, then stages 2 to 5 again. Conditions were good, as we were blessed with some blue sky for once. Such a contrast to the previous day! 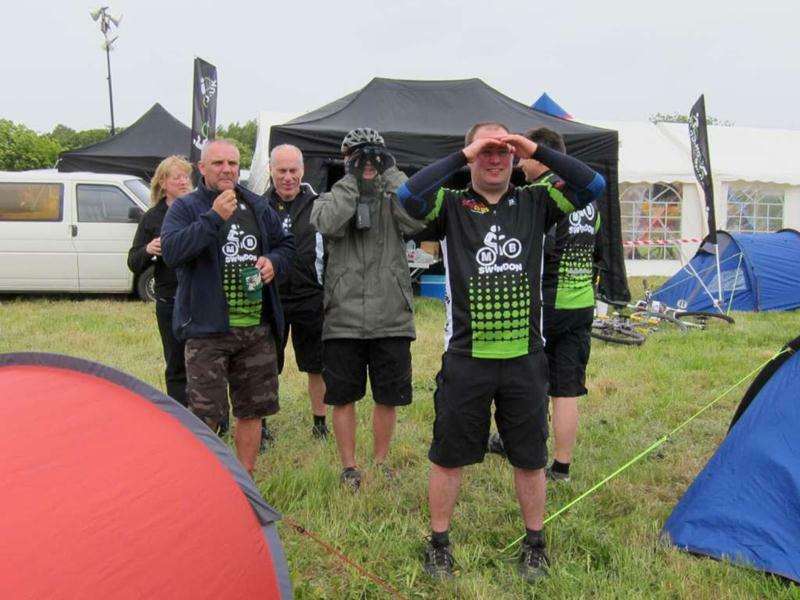 We were also joined by club member Phil Clark, who was competing in his first ever Enduro. For me the day started pretty badly, with a few tumbles on the first couple of stages, but then got back into the flow of things. James, Sandy and Phil all had their own moments here and there, Sandy unfortunately snapping his rear mech on stage 2. Rather than going singlespeed, he decided to go chainless for a couple of runs, which was great to watch! James managed to hit a tree flat out on stage 9, but thankfully the tree was fine. Bashing down the stone staircase into the arena area to finish the final run was pretty cool, having never raced a flight of steps before. Masses of spectators, cowbells and airhorns adding to the atmosphere dramatically. So glad I didn’t stack it with so many people waiting with camera phones at the ready for any carnage! So that was it, the 2015 Mondraker Enduro Series was over. Clocking out, it was time to compare times and see where we ended up in the grand scheme of things. Somehow, after 2 days and 13 timed runs, me and James Scott ended up with identical times! Which put us joint 6th in Master category. Sandy, having gone chainless for a couple of runs, actually completed one of the stages only 8 seconds behind me, which is scary because I had to put quite a few cranks in coming out of corners to get things going, so he must have been carrying so much speed! Big kudos for Phil Clark, who smashed his first enduro, picking one of the more difficult, technically challenging enduros to start with. Good man! At the time of writing final series positions have not been released. Big thanks to our sponsors for keeping the dream alive. Without their support, none of this would be possible. With the weather forecast predicting torrential rain for most of the weekend, for the first time ever, my preparations included packing the wellies. There didn’t appear to be any hope of dry riding this weekend, so thought my feet might as well stay dry when I’m wondering around the race village instead. That and swapping my spuds for flats. I’ve never raced in flats before. Actually, I haven’t really ridden in flats very much in the last few years, so I was hoping I hadn’t picked up too many bad habits. It chucked it down for the whole drive up there. Proper rain as well, none of this pathetic drizzly stuff, proper full on biblical rain. It played havoc with the stages. Like all the previous rounds of the Mondraker Enduro Series, most of the stages are hand cut in steep hillsides; lots of loam, roots and tight, twisty switchbacks. Add a few days of torrential rain and things become very interesting indeed. So for Saturday we had 2 hours to practice 3 stages, followed by 1 timed run down each stage in the afternoon. Usual relaxed Redkite style of no set stage times or transitions, just turn up for your runs between 1pm and 4pm. The 3 stages we had to practice were all of the style we had been expecting, but with saturated ground proving very difficult to ride them anywhere near clean. Some sections were like mango swamps, full on slop with hundreds of roots littered underneath. 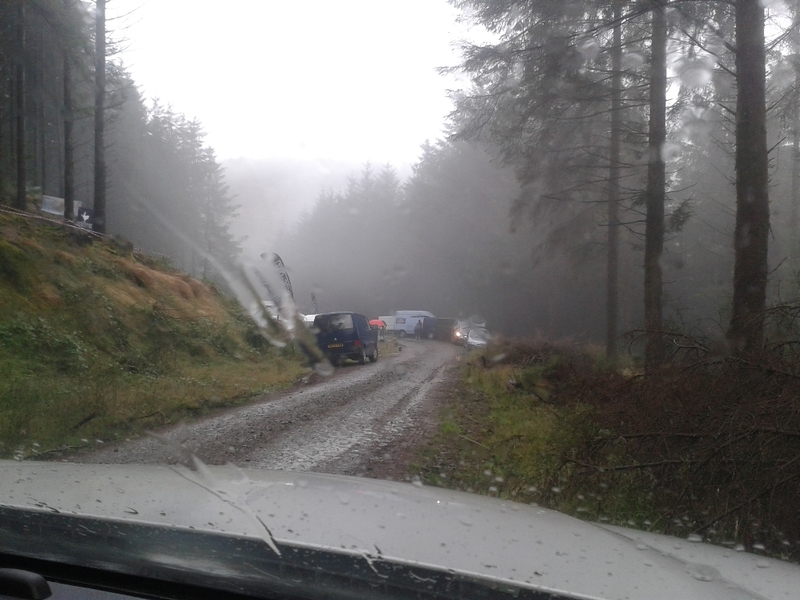 The only surfaced parts of the stages were the fire roads we crossed! Towards the end of practice the rain had stopped and the trails were drying out surprisingly quickly. But come the timed runs, the stages had changed loads. All the high lines had had all the soil stripped off by a hundred tyres, leaving polished clay behind. 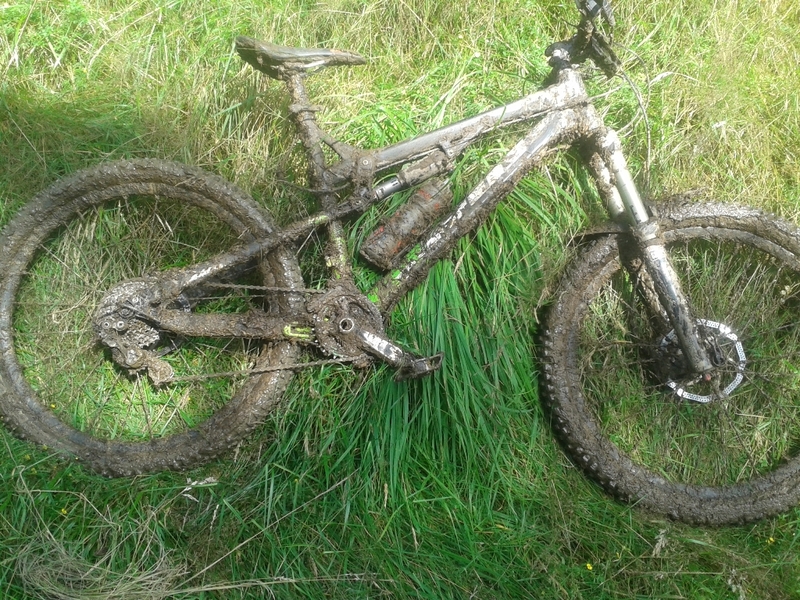 The stripped material had ended up at the lowest point of the trail, drying nicely to a claggy mess. Once your tyres had picked up some of this, it was ice skating time! 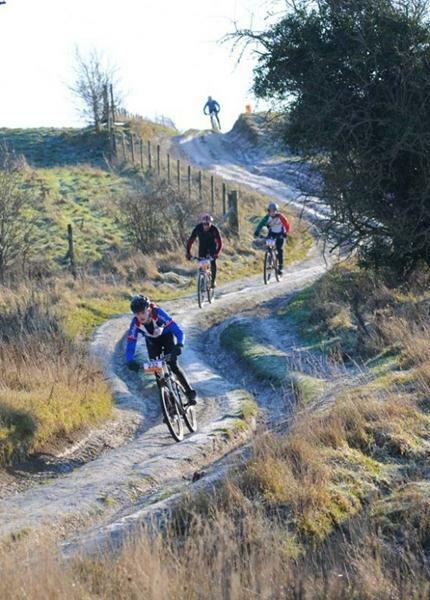 Particularly treacherous was the drop into the quarry on stage 2; the roll in was steep, off camber and rooty. All you could do was try and get the bike as straight as possible before going over the edge. Not easy when you have zero grip! The timed runs went well. I’d decided beforehand that I wasn’t going to be a hero. My usual style is to go flat out everywhere, huck it off random objects and try not to take it too seriously. It’s not usually the fastest way down (I inevitably crash at some point) but it sure is fun. 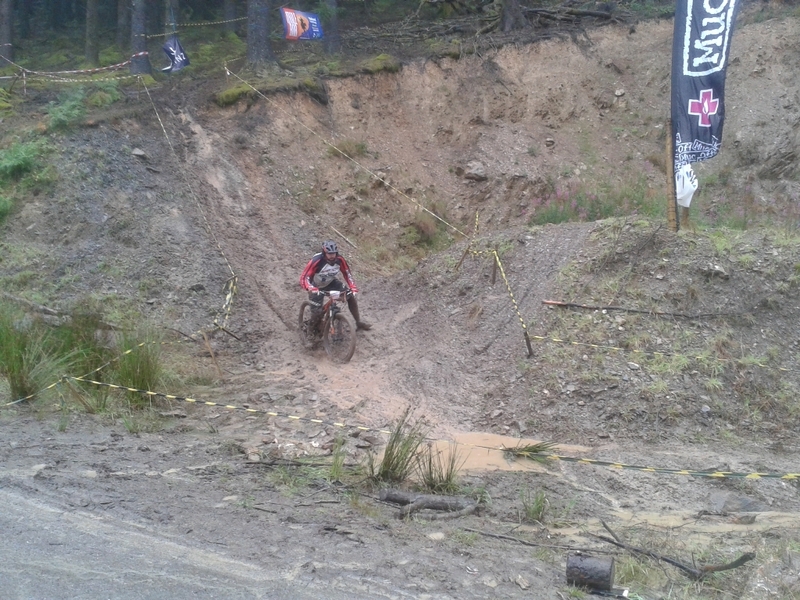 But for this race it was far too slippery to mess about. So I took it slower, tried to ride it a bit cleaner, and just stay on the bike, which I managed to do. I finished Saturday 8th in Masters, which was etter than I was expecting. Overnight came plenty more rain. In fact the organisers decided that it was just too dangerous to run some of the stages as they were. So some changes were made, including removing the hairy drop into the quarry that was on stage 2. 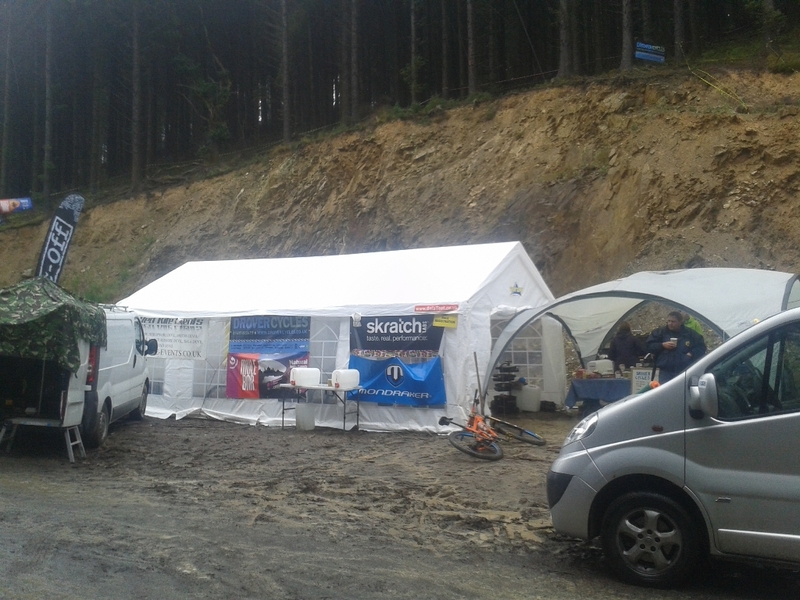 So with 7 stages to race (no practicing today) there was no point in hanging around as the rain was never going to stop, so you just had to get on with it. Luckily for me, we were treated to some surfaced trails on some of the stages. So for these I reverted back to standard riding style; disengage brain and wind it up to warp factor 9. 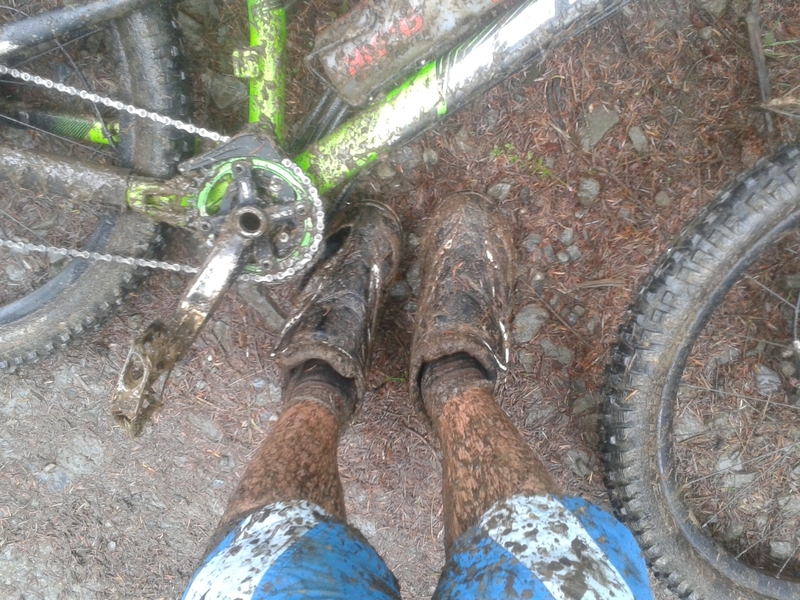 I don’t have an issue with riding flat out on surfaced trails or rock based stages, even in the pouring rain. Years of riding motorbikes have probably desensitised me to speed. For the steep, tight, loamy stages I just had to keep my head on and keep it rubber side down. It’s taken me a while, but I’ve finally realised I can’t ride flat out on wet mud. So if I slow down and skip the bit where I have to get back on the bike, then I finish that bit quicker. Simple really. With no real drama on any of the 7 stages, coupled with riding like a loon on the surfaced bits, meant that I managed to climb up to 4th position in Masters over the 2 days. 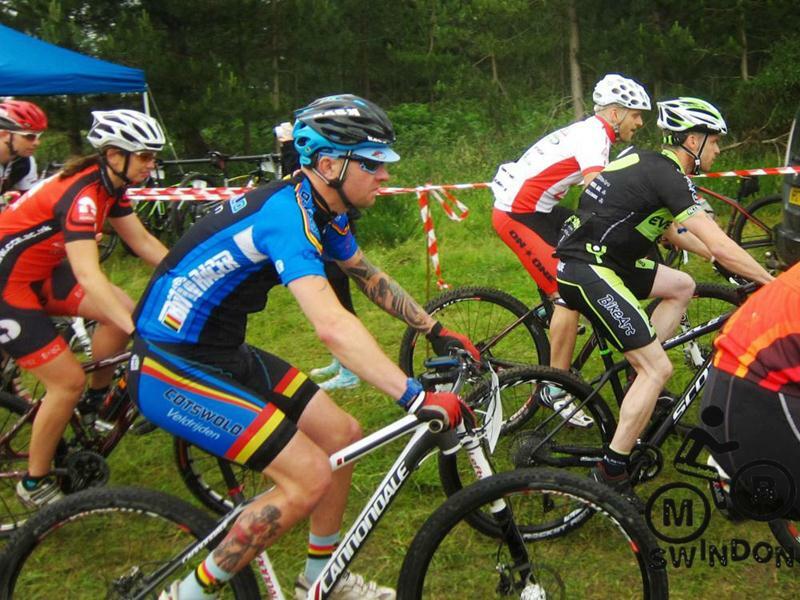 The weather was as bad as it could get for August, but it was still a great weekend of racing up at Coed Trallwm. Special thanks have to go to the organisers and marshals, who had to stand out in awful conditions all weekend while we played in the mud. 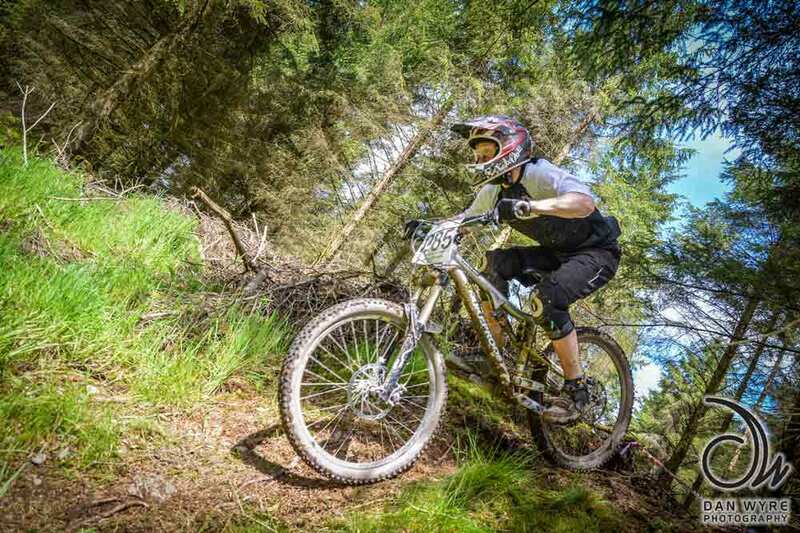 The 5th and final round of the Mondraker Enduro Series will be on 24th & 25th October at Baskerville Hall near Hay-on-Wye, so why not come along and have a go? So round 3 took us back to Crychan Forest. We stopped here for a round in the 2014 series, when the stages contained lots of rocky tracks and some bits of freshly cut trails. Would the balance still be heavily in favour of the existing rocky tracks? Or have the Redkite Team been slaving away for the last few months building some of the maddest, baddest trails I’ve ever had the privilege to ride? I think you may know the answer already…. Bank Holiday traffic meant I arrived late, literally as practice was starting. As we only had a 2 hour practice slot, I quickly signed in, slapped my number on the bike and felt very grateful to find my partner in crime for the weekend; Sandy Stewart, still waiting for me. Mumbling my apologies for lateness, blaming holiday makers and Roadies in equal measure, we peddled off in search of stage 1. As I quickly recalled last year’s stages to Sandy (loose rock, bedrock, fast, disengage brain kind of riding), we found the start of stage 1, on a fire road. Goggle & glasses on (depending how enduro you are) and we set off down the fire road. It was very reminiscent of last year’s stages; loose rock, bedrock and very fast. After a combination of lengthy rocky tracks, losing a lot of height, it turned off down a steep, narrow goat track that was rutted out, to a stream crossing for the finish. Nothing too technical, just a bit like trying to go as fast as possible whilst riding on a bucking bronco! Up to stage 2 and it couldn’t have been more different. Straight out onto a fresh loam trail, starting off quite flat, swerving round trees, dodging stumps and hopping over roots. Stopping to take a peek at a tasty drop, which had a 90 degree right-hander going in, a 6 foot near vertical drop, then a 90 degree left-hander immediately after. The exit contained a high line skimming some trees with masses of roots, or alternatively, the tight low line with ruts. With Simon Nash’s voice in my head saying ‘Don’t be a sheep’ I saw The Line. I decided to do a straight line between the trees, which meant going off the drop at a dodgy angle, then continuing in the ruts on the low line. Yeah well, that was how it played in my head. In practice, at the bottom of the drop I burped the front tyre on some rocks (where did they come from?) and ended up sliding down the rut, face buried deep in the mud. As I was such a cool cat and didn’t want to wear a backpack, I then had to sit and wait for somebody to come past with a pump. Whilst waiting, Sandy showed me how to do it properly (don’t straight line it, high line out), I decided I would just copy him, which worked out well. The rest of the stage was very similar, lush loamy corners, masses of roots and a techy drop with lots of roots at awkward angles on the lip which made us stop for a look. It’s great being able to do a practice run so you can look before you leap! Peddling up to stage 3, we certainly had plenty to talk about; would this be the most technical stage of the weekend or did the Redkite guys have something else hidden up their sleeves? Bumping into Neil on the climb, he laughed when we asked him if stage 2 was the most technical stage, “You’ll want to go have a look a stage 3 then”. Kyle the Trail building wizard was at the fire road crossing of stage 3. He started grinning when we asked him what it was like. This could be interesting then. We decided to go from this point rather than the start; I recognised the top section from 2014 and knew it wouldn’t pose too many problems. Dropping in, it soon got down to business. Steep, off camber traversing lines (with plenty of roots obviously) then a ridiculously steep left hand switchback. I stopped to have a look at line choice and realised there was about 6 switchbacks in a row down the side of the hill. Now, this hill was super steep, on loamy soil which just got dragged around, some corners were dragged out in the middle, making the nose point straight down for far too long for my liking. Mental. Having not ridden anything quite as lairy as this, I jumped back on the bike. Trying to get the bike moving again whilst trouser tenting out the front and turtle heading out the back, knees knocking in the middle I wobbled off down the hill. Somehow, I managed to go round them without too much drama, the odd drag of the foot here and there, but I was almost in control. Even James Scott would be proud. Further down the trail, there was another big steep drop, just about rollable with your bum buzzing the back tyre, then more of these loamy switchbacks. Here I got caught out. Thinking I had this great line, I didn’t see the tree stump jump out at me until it was too late. Cue Superman impression number 2. Finally making to the bottom, I couldn’t quite decide if I had just ridden the best trail of my life, or the scariest, or what. But one thing’s for sure, I was buzzing and couldn’t wait to race it! Time was getting on. We had to make a decision on whether to do stage 3 again, to link it all up in one run, or have a bash at stage 4. There wasn’t enough time to do both. There were rumours about a drop in the middle of 4 that was a bit loopy, so we decided to go and see what the fuss was about. Stage 4. The top was roughly following a worn track through the trees, some interesting taping meant you had to keep your head up as you never quite knew where you were going. Although this was cut through the trees, a la off piste some would say, the ground was firm and compacted, which kept the speeds up and gave it some flow. Cutting across the fire road, we soon saw the rumoured drop. A small queue had formed whilst somebody picked themselves off the dirt at the bottom. Steep, loose loam and a 90 degree left-hander at the bottom made it very tricky indeed. I got down it fine, but ended up going into the corner skiing behind the bike, not quite pro just yet then! 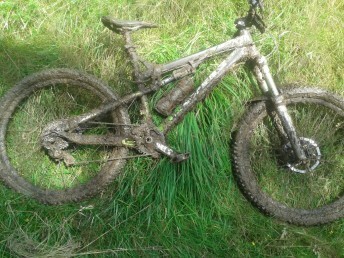 The rest of the stage was great; lots more roots, techy corners and lush loam! A short rocky singletrack sprint mixed it up a bit, then across a bridge to the finish. Another Brilliant stage! Time to go pick up the transponders and do some racing! Getting back to the event village and it became apparent that someone had been busy! Drover cycles had a big stand up selling everything that might be required for the weekend, plus their barbeque going at full tilt to fuel all the hungry riders. A great little setup, people were chilling out all around, just perfect with the car park being a right little suntrap. Although for me, my racing was over before it started. On returning to the car, I had a phone call about a family issue back home which required my immediate attention. The weekend brought to a premature close, I loaded the car back up, made my apologies to Sandy for having to leave him waving the MBSwindon flag on his own and I was soon homeward bound. I had a blast on the 4 stages I did manage to ride, but would of loved to put down some race runs! The Mondraker Enduro Series isn’t a series of predictable trail centre runs, where you just blat around full chat everywhere, safe in the knowledge that the next corner will be the same as the last. This is a real skills test which will push you to the edge of your comfort zone, then a bit further! 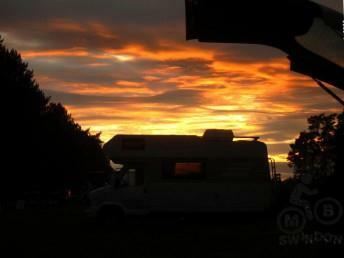 I can’t wait for round 4, which will be returning to Crychan Forest on 22nd & 23rd August. Hopefully see some of you guys there? Photos courtesy of Dan Wyre of www.danwyrephotography.co.uk who takes some cracking shots at each race. Check them out on his website or on rootsandrain. Waking up to my alarm at stupid o’clock on a Saturday morning, a grin spreads across my face. It’s Redkite Enduro round 2 time! A quick check over that the essentials were packed the night before (how organised am I?) –then porridge for breakfast and a gallon of coffee for the journey, KISS FM being the radio station of choice for this particular drive. Arriving nice and early, I didn’t have much to do. James had stayed the previous night along with Jerome & Gary Lee. As I was lodging in James’ tent again, all I had to do was throw in a sleeping bag and pillow. Except I had forgotten my pillow. Again! I signed in, stuck a number board on, then got slightly distracted by the coffee and toast facilities and preceded to start on breakfast number 2. Suitably stuffed, it was time to get clued up and check the map to see where we were going. Not that I really knew where we were, but I stared at the map for a bit anyway. There were two stages to practice in the morning, then timed runs on them from 2pm. Simple enough. We were allowed to drive to the start of stage 1, so a quick check of the bike followed. 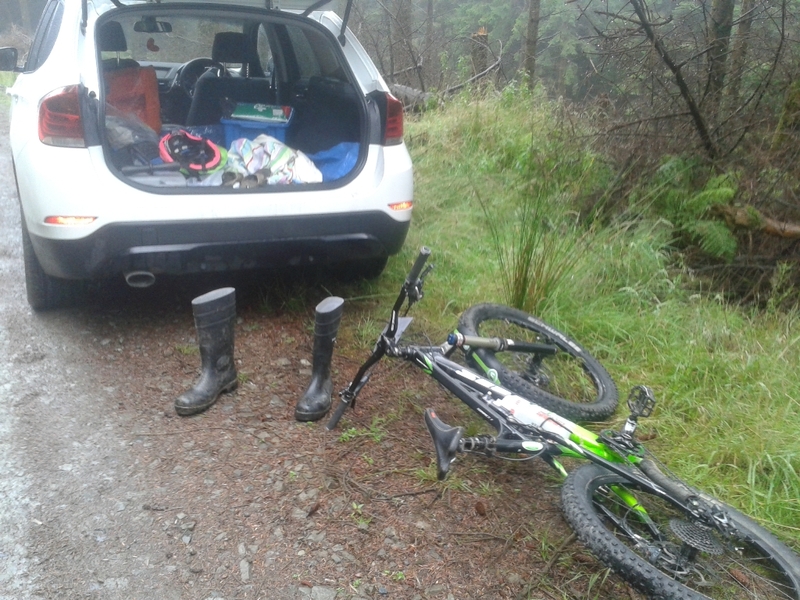 I carried out the standard pre-ride mountain bike check: ride round a bit, change gear a few times, poke the tyres, pull a skid, try and pull a wheelie (nope, still crap at that) before slinging it into the back of James’ wagon. Practice went well. Stage 1 started off fairly level, in dense forest. Then a bit of stump swerving followed, before dropping onto a bedrock track for some full-beans rock skipping. Then came a few tight corners linking more flat-out rocky sections, before a nice freshly cut section dropped you onto the finish. Stage 2 was similar but totally different! Lots of tree weaving and stump swerving for the first half, followed by a short fireroad sprint, motocross style whoops, and then a flat-out rutted section with deep gulleys on the side. Two things became apparent quite quickly; my recently replaced chain was too long, and my brakes were !*&#! (Translation: less effective than I had hoped for). We were all more than happy with the stages, and spent the next few hours practicing various sections and socialising in the glorious sunshine that we had been blessed with. The timed runs went a bit differently (well, not for James, who put in great runs down both stages). But somehow I managed to get crossed up on some roots at the start of stage 1 and exited via the front door. Extra time was lost straightening the bars out. Then on the final fast, rutted section on stage 2, a momentary lapse of concentration and I was in a deep rut sliding on my side, minus the bike. With the days racing behind us, we decided that we would have a sneak peek at the three extra stages for Sunday. But 45 mins in to the transition and going solidly uphill with no signs of a let-up, we did an about turn and headed back to the camp. It may or may not have been my idea to turn around, but everyone was pleased when we reached the camp to be greeted by ice cold beer. Spending all day out on the bike in sweltering conditions and then being greeted with ice cold beer? Amazing. After a blissful hot shower and a clean pair of pants, it was off to the Drovers Rest for the carb-loading pasta party. As the beer flowed, so did the stories of the day’s racing. Out on the terrace decking overlooking the river, a big screen was setup showing Peaty’s ‘Won’t back down’; a fine way to spend the evening. It had been a long day and I was shattered after all the riding, so it was not long before I was doing my best nodding dog impression and decided to retire to my airbed, leaving the rest of the guys to carry the party on. Waking up to more sunshine, feeling suitably refreshed, it was time to sort out the two niggling issues I’d had with the bike yesterday: take a link out of the chain, and swap the pads. I had been running Superstar Components sintered pads front and back, mainly for economic reasons, but they are a bit noisy! They last for ages which are great, but they don’t have the progressiveness that I like. It goes a bit like this: grab lever a bit, brake squeals. Bit harder, squeals louder. Harder again, louder still, start slowing down. Grab a handful, noise stops, wheel locks up. So out with the Superstar pads, in with some of Fibrax’s Organic long life pads. A few runs up and down the road and they had bedded in nicely. Once bedded in, they were lovely and quiet. Now nobody could hear when I was dragging the brakes! So back to the racing. Today we had 5 stages of racing spread out over 40km of terrain. Filling the bladder to the top with High5 Energy source, it was time to swing a leg over my trusty steed and get moving. I made some friends and had some good banter with some Welsh lads on the 8km climb to stage 1. Stages 1 and 2 were the same as yesterday. I was determined to go all out and make up the lost time from riding like a clown yesterday, but with added focus on staying rubber side down. The first stage was good, felt fast, nice and clean with no major mistakes. Waiting in the queue at the start of stage 2, I turned to see Jerome performing surgery on his upturned bike again. A better performance today on stage 2 – mainly by staying out of the ruts this time – gave me another clean stage with no concerns. Off to stage 3: it was a big transition, with huge panoramic views. Wishing I had packed a camera, we passed some guys on motorbikes doing their own enduro. Stage 3 was a pedal fest, with plenty of wide, loose corners to slide around. There was a fast bedrock section and if you stayed off the brakes and kept it flat out, the drops and crests appeared blind. I’ll be honest; I bottled it on one. On the approach it looked huge, like a jump into the abyss or something. I dropped the anchor, shrugged off a load of speed and rolled it. Better to be safe than sorry (did I really just say that?). I then had to spend the next 20 seconds beasting my legs to get back up to speed. The stage finished with more loose corners, one especially tight as it dropped onto a fireroad and switched back on itself, then a long sprint to finish. On the transition to stage 4, we passed a hill where it looked like the face had been quarried at some point. Loads of loose slate and really steep, it was too tempting to just ride past. So that kept us entertained for the next hour, hiking up just to ride back down! Stage 4 was another fast and loose one, with the bonus of meeting Tom Stickland’s mum, who was marshalling the finish. Hi Tom’s Mum! And so, on to the final stage! There were rumours circulating about stage 5 that went along the lines of ‘A massive rut on the steepest part, but lines for those that spot them’. Well, James & I decided to have a walk down and take a look. I’m really glad we did, as the lines were there to avoid the rut, but riding it blind you would struggle to see them, as Jerome later demonstrated. He went in blind, hit the rut and went straight over the bars. On the race run, I knew where I wanted to be, stayed on line, missed the rut totally and carried some good speed into the flatter second half. A good sprint saw me to the finish of the stage, and indeed the finish of the race. Being in such good spirits, a bit of messing around was the order for the ride back to base. The obligatory mate’s race had us all laughing, with nobody getting near Jerome on the up hills. A celebratory ice cold post race beer back at base was a fantastic way to finish a great weekend of racing. Don’t get dehydrated; you fall off your bike more. I totally underestimated my fluid intake on the Saturday; thankfully James is much more prepared than me! It doesn’t matter if you have a clutch rear mech & chain guide, if your chain is too long it will still make a hell of a racket. Fibrax Organic long life pads are the new favourites. Their progressiveness is just awesome! At every race there should be ice cold celebratory beer when you finish. 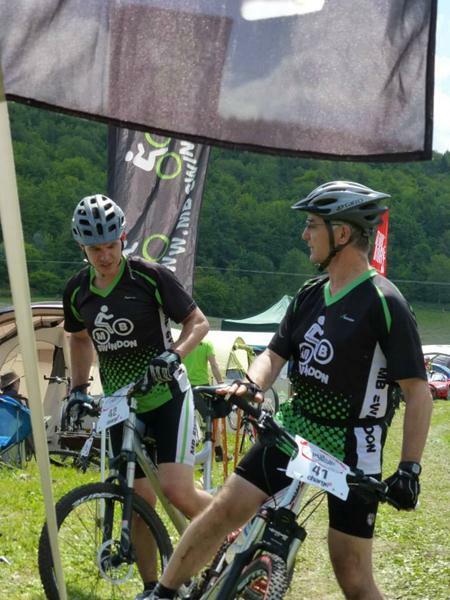 So after 2 days of racing, 7 stages and approximately 60km, the final standings were: Phil 9th and James 11th. In a field as stacked as this, we were both happy with that. So another great weekend in Llanwrtyd Wells with Redkite Events/Empire Cycles. They seem to have got it sorted there, fantastic trails, great organisation, and did I mention ice cold beer at the finish? Everything just adds up to an amazing experience. We love it. Round 3 of the enduro series – the final round – is on 25/26th October and we can’t wait! Why not come and join us? The event details are up on the MB Swindon calendar. See you there. Redkite events/Empire cycles enduro round 2 on the weekend of July 26th & 27th promises to be an absolute corker of an event. 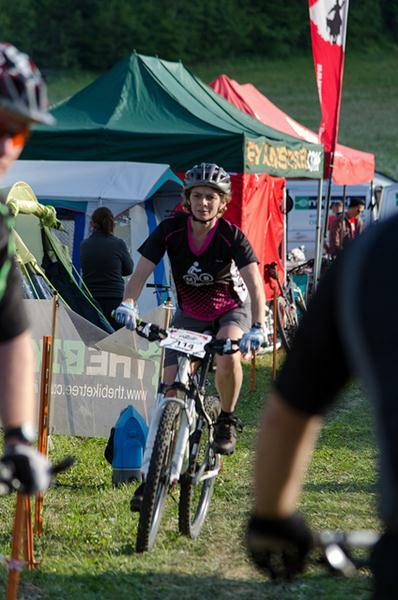 Round 1 was an awesome weekend of laid back racing on amazing trails in a brilliant location. Round 2 promises to be even bigger and better! The Gravity Team will be there, pulling skids and wheelies, so why not join them for this great event? New for round 2, there will be a Sunday only option, for those that cannot make the whole weekend. 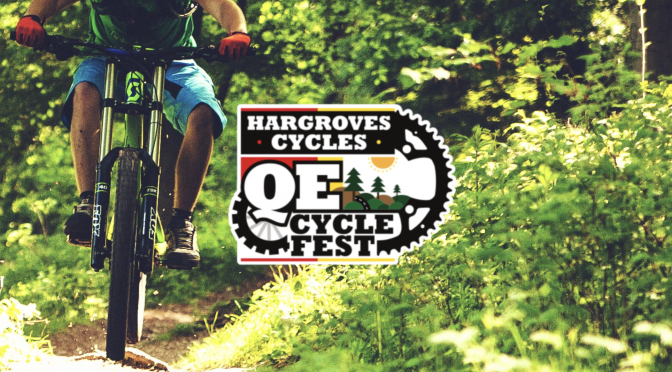 Hargroves Cycles bring you the 2013 QECycleFest. Named after the venue of Queen Elizabeth park, home to the QECP trail collective. There’s a 4 hour enduro race on the Saturday evening followed by a demo day on Sunday. There’s also a road sportive on the Saturday if you’re that way inclined. See the 2012 photos for an idea of what to expect. Event website. 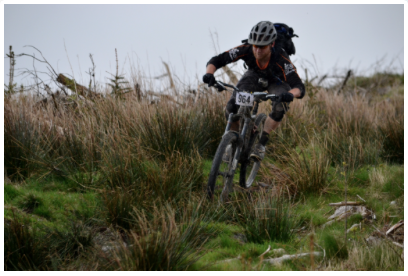 Online entry for the MTB event (road sportive). There’s also a demo day at the Croft Trail in Swindon on Sunday the 5th of May.